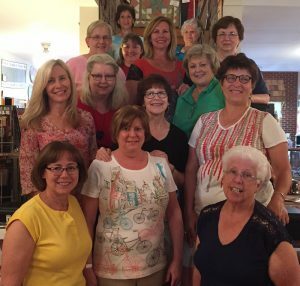 Last fall I got invited to a quilting retreat with a group called The Rambling River Art Quilters, as an “extra”. A few months later, they called me up and asked me to join the group! They’re a really fun bunch, so of course, I said YES! The group is divided into the East Side and the West side, since part of the group is from the St. Louis area, and part of the group is from the Kansas City area. Then there’s me, smack in the middle — but the West side adopted me! Each “side” meets up a few times a year, and stitches together, but . . .
A couple times a year, the two sides meet in the middle, and the last few times, they’ve chosen the Brunswick Lodging & Event Center as their meetin’ place — a wise choice indeed — and it’s connected to Sew Sweet Quilt Shop, so there’s plenty of shopping that can be done while retreating! Last weekend was my first retreat to attend with them as a bona fide member! We had so much fun! They’re all still working on some group projects they’ve had in the works for a while, but we also got marching orders for our next group project, and I get to be in on this one — I’m so excited! You won’t see it for a long time, because thankfully, they give us ample time to work on our pieces, but rest assured, I will show you when I can. Here’s the group, taking a break from sewing to go shopping. I know more than one of us needed more fabric just to make it through the weekend! After the first day, when Michelle sewed through her finger with her sewing machine, and Candy tried to break the sidewalk by flinging herself down on it, the weekend went pretty smoothly. Well, up until My Cowboy tried to give Edie a heart attack by attempting to run her down on the main street with his truck! During the first retreat I attended with them, one of the girls said: “What happens at retreat, stays at retreat!” to which I replied: “Unless you’re at retreat with a blogger who collects random quotes and publishes them on her blog!” I don’t think they believed me, until my retreat recap was posted. So now the girls have learned that whatever they might say during the course of the weekend is fair game for showing up here on the ol’ blog, so I was told upon my arrival that they had been talking about all the things they didn’t want repeated before I got there — and after I got there, I was threatened every once in awhile with “if that shows up on your blog, I’ll . . .”, even though I assured them that none of the quotes I publish are ever attributed to a specific person . . . I laughed so hard I almost had to change my shirt! I love retreats. Your retreat quotes always crack me up.